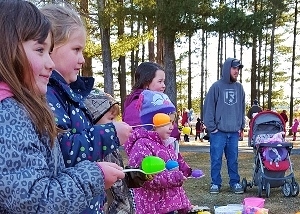 Grab your basket and hop over to Prouty Beach for a springtime party to beat the mud-season melt down! Visit with the Easter Bunny, make festive crafts, play games and win EGGscellent prizes. At 11 o'clock sharp, the Easter Bunny opens the egg yard for the big hunt! Over 2,000 eggs filled with treats, toys and a few extra special prizes hidden inside. 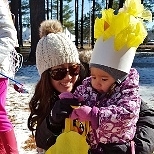 Anyone can enter the annual bonnet contest at Prouty Beach - just find a festive Easter hat to wear, or better yet, create your own masterpiece! Kids can strut their wacky and fun caps around with the Easter Bunny just before the hunt begins to win a BEST BONNET prize! Five winners are selected based on originality, creativity and style! 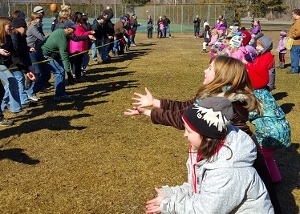 Always guaranteed to be a "smash," the egg toss is the grand finale and a family favorite at our party. With real, un-cooked eggs, tossers move further and further apart each round until one lucky team is left with their egg intact! Cracks are okay, but be sure to choose the toughest shell in the carton, because once your egg breaks open, your team is out of the contest. Pairs are comprised of one adult (16+) and one child, first-come, first-serve until we run out of eggs! 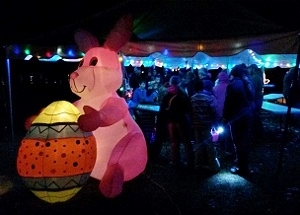 Guided by flashlight, over 1,000 glowing and non-glowing eggs are hidden around Prouty Beach park. From the upper pines to the waterfront, the Glow Hunt covers almost an acre of darkness. 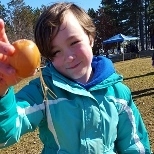 Some eggs contain candy and trinkets but twenty special eggs carry prize tickets for awesome glow-in-the-dark gear like lava lamps, frisbees, puzzles and star packs! Participants should come prepared with a flashlight or head lamp and weather-appropriate footwear. Advanced tickets $10 or $15 at the gate. Tickets on sale March 27th, 2019. THIS YEAR'S EGG HUNT WILL BE HELD INSIDE THE MUNICIPAL GYM DUE TO RAIN!